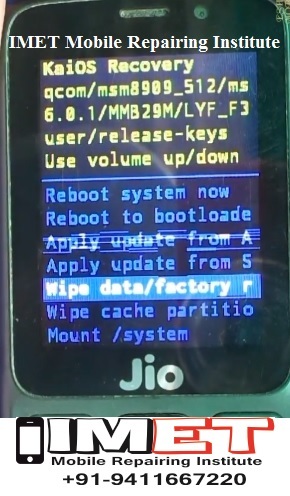 How to factory reset Jio Lyf Phone ? How to wipe all data in Jio Lyf? How to bypass screen lock in Jio Phone? How to restore defaults in Jio Lyf? 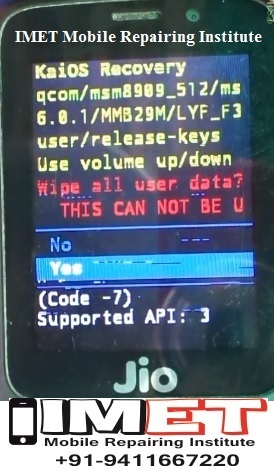 The following tutorial shows all method of master reset Jio Lyf Phone. Check out how to accomplish hard reset by hardware keys and settings. As a result your LYF feature phone will be as new and your core will run faster. 1.Begin by turning off your device using the Power button. 2.Then press and hold together Volume Up and Power key for a few seconds. 3.Release held keys as soon as you see the JIO LYF icon. 4.Next, use Volume buttons in order to select “wipe data/factory reset” and tap the Power button to confirm. 5.Choose “yes” from the menu, and accept it with Power button. 6.When a Recovery Mode appears again on the screen accept option “reboot system now” using Power rocker. 7.Success! You have just performed a hard reset operation.